Have you ever looked at your electricity bill, tried to decipher it, given up and then thrown it back into your pile of “bills you’ll take of later?” With all the dizzying numerals and terminology strewn across the page, it’s easy to get lost while trying to determine your monthly electric charges. There are many benefits to understanding how your bill is broken down, such as catching errors that can result in saving some bucks, so we’re here to help. Are you on a monthly billing plan or a budget billing plan? If you’re on a monthly billing plan, this means that your monthly charge from your utility company or your supply company is going to fluctuate based on the number of kilowatt hours your household or business consumes each month. You’ll especially see a difference when the seasons change; if you live in a hot part of the country, you’re likely going to use your air conditioning more, resulting in a higher electric bill. On the contrary, you may see lower charges in the winter due to lower AC usage. With budget billing plans, your utility company takes the number of electric kilowatt hours you consumed last year and creates a monthly average for you to pay, since it assumes you’re going to consume around the same amount of kilowatt hours as the year prior. Which bill are you looking at? Utility bills can be difficult to differentiate between, especially if yours arrives in a bundle mixed with other municipal bills. So, before you start trying to read your electric bill, make sure that’s what you have in hand. One way to differentiate is through units of measurement: Electricity is measured in kilowatt hours (kWh), and natural gas usage is measured in a few different forms: hundred cubic feet (Ccf), one thousand cubic feet (Mcf), Therms or British Thermal Units (BTU). View our Glossary of Bill and Energy Terms for Consumers for more information on these terms. Water is measured in gallons. When you look at your charges breakdown, you’ll see many different figures. Not only do your monthly payments cover the amount of energy you consume, they also cover costs for the utility to maintain the grid and pay their workers. Your payments also include charges related to delivery, supply, taxes, as well as other fees, and these different items are all factored into your total amount due. It’s important to understand how much you’re paying at each line so that you can catch any errors in charges and for your own general comprehension of where your money is being spent. This last point particularly applies to those living in deregulated states, since these residents and business owners may have the option of choosing an energy supplier that can deliver power to their homes or businesses at lower prices than what they’re currently paying. An example of all the charges that go into a power bill from Duquesne Light Co. If you want to gage how much electricity you’re using each month, especially if your bills seem higher than you’d like them to be, this is a great idea. You can find the figures you need under “Meter Information.” Look for the terms “previous” and “present” and you’ll find the number of kilowatt hours you consumed between the two months and their difference. Many utilities will break down your daily usage in addition to your monthly, so you’ll be able to track when you may have used your air conditioner in lesser or greater amounts during hotter and cooler times of weeks. When measuring your usage, be sure you’re assessing it for the same period of which you’re being billed – for most consumers this is monthly. Some electric companies use a tiered billing structure, where a certain number of consumed kilowatt hours is charged at a certain rate and every hour after is charged at a different one. For example, your first 600 kilowatt hours may be one price and your 601st may be another. All you need to do to determine the number of hours of electricity you consumed in a month is to add together the number of hours used in each tier and that will give you your total (see image below). 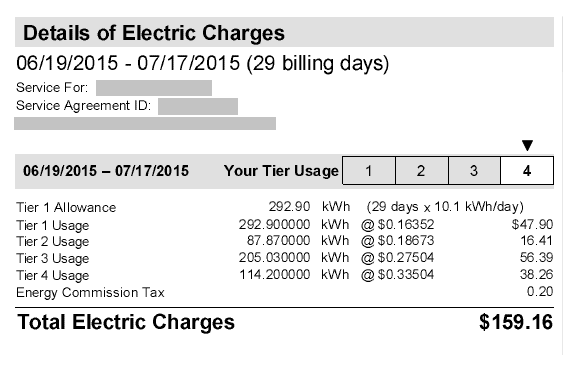 How much am I paying for my electricity each month? First you need to translate your bill to a metric where you can compare your electricity consumption to its cost. Unless you’re on a budget billing plan, this is generally broken down to monthly units (Review Point #1). On your bill, find your total supply cost or total generation cost for electricity and divide that figure by the total number of the kilowatt hours you used in that period. You can find your total kilowatt hours consumed in a multiplication equation located directly to the right of the electricity supply charge or the generation charge, or under a heading titled “Total Usage” (see below image). For example, a $31.98 supply charge divided by 491 KWH equals 6.5 cents per kilowatt hour. Thus, 6.5 cents per kilowatt hour is your current electric cost. 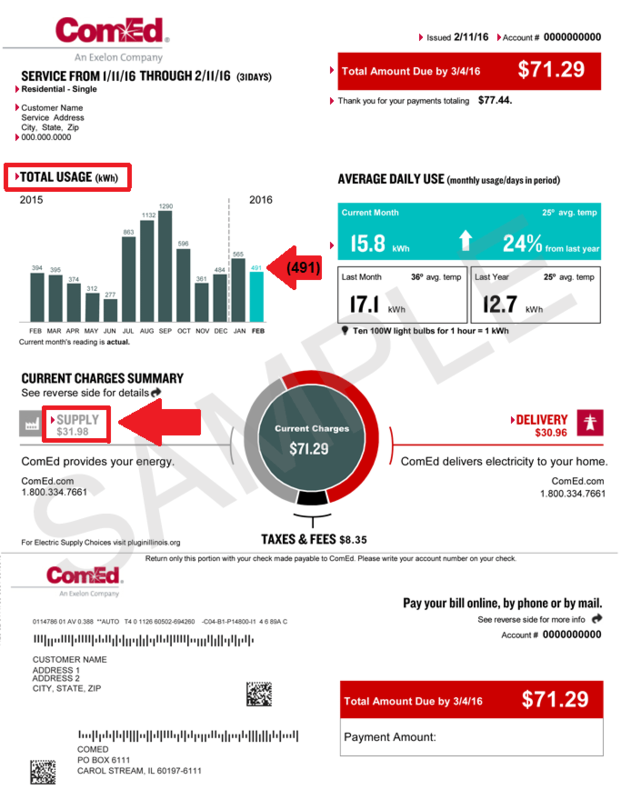 This is the easiest way to break down your bill to a metric where you can compare what you’re being charged to how much electricity you’re consuming each month. Knowing this calculation is important so you can see for yourself how expensive or inexpensive your power truly is, especially when comparing prices between energy suppliers. What if I’m still having trouble interpreting my bill, or I find errors on it? Call your utility and request an itemized bill if you need assistance clarifying charges. Report all errors to your utility immediately.